Spark Plug Spanner Wrench is a For specialized tool for manual disassembly For Spark plug, when used according to the For Spark plug and For Spark plug assembly position hexagonal size, choice of different heights and radial dimensions of the For Spark plug socket.When disassembly For Spark plugs, should set a positive For Spark plugs and then pull the switch,in order to avoid slipping sleeve. Pull the switch when the For Spark plug socket,not allowed to freely extended handles to avoid damage to the sleeve. You'll need just a few tools to change out the spark plugs on your car or your motorbike. The most important tool is a socket wrench with an extension and a spark plug socket. Spark plug sockets come in two sizes: 5/8 inches and 13/16 inches. Most spark plug sockets have a rubber insert that holds the plug snugly in place. You may also need a universal joint if your spark plugs are difficult to reach. Universal joints are articulated joints that allow you to turn the wrench in one axis and convert this motion into a rotation around another axis. If you can't maneuver a wrench and extension in the space around your spark plugs, a universal joint may help. Looking for ideal Spark Plug Wrench Manufacturer & supplier ? We have a wide selection at great prices to help you get creative. All the Spark Plug Socket are quality guaranteed. 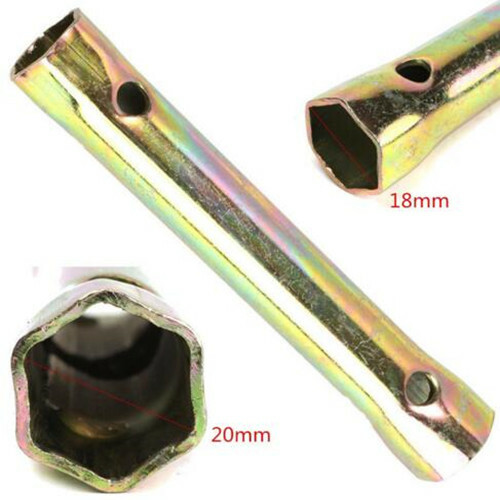 We are China Origin Factory of Spark Plug Spanner Wrench Tool. If you have any question, please feel free to contact us.